In creating compensation plans inside Enterprise Compensation Management, the main need of it is to have it available in the MSS Compensation Tool for managers to use and plan against. However, at times there are needs not to display the compensation plan in MSS and only use it via infotype 0759 by the HR department. This tip was shown to me by an Anonymous Towers Perrin consultant (person perfer to remain anonymous). To do this is actually very easy and it does explain in the SAP help document (which I had overlooked). What first need to be done is create a separated compensation review period and attach all compensation plans you wish NOT to show in MSS compensation planning screen to it. 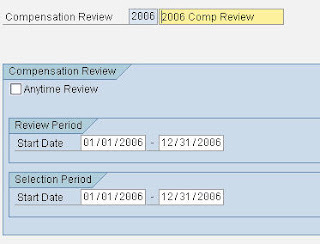 SPRO -> Personnel Management -> Enterprise Compensation Management -> Compensation Administration -> Compensation Plans and Reviews -> "Define Compensation Reviews"
As you can see from the screen above, this is the configuration screen for Compensation Review. You normally would have one where you would attach MERIT compensation plans and/or BONUS, etc to. In the case of certain compensation plans not wanting to be display in MSS, you simplity would need to not specify any dates in the "Review Period". See help documents below. 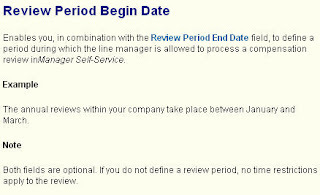 As you can see in the verbiages, it said "...to define a period during which the line manager is allowed to process a compensation review in Manager Self-Service". By not specifying a review period, you are NOT allowing the line manager to process the compensation plan in MSS, as the result it is not visible to them to select. This is extremely useful in situation where HR has certain compensation plans restricted to certain individual where they would prefer it be administer via IT0759, rather through MSS. Thank you very much! was looking to do this for weeks, tried with the Badi HRECM00_CONSISTENCY and authorizations but did not work according to needs. I have a question here. The SAP documentation says "...if no date is specified, no restrictions apply". What I understood was that, if no dates are specified then the compensation plan is open for review round the year. This might be useful in case of one time bonus - since there is no way to determine what time of the year the manager might need to give it out. But what your post says is exactly the opposite.Then how do we configure the dates for a compensation plan that is available for review round the year. Is it by putting the dates 01/01/1800 -31/12/9999?